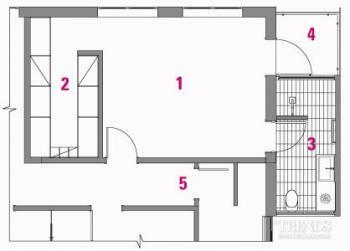 Where do you turn as a renovating architect when the existing master suite doesn't quite meet spatial needs and the existing services are hard to reroute? Well one savvy design response is to build a pop-out on the side of the building. This comprehensive master suite makeover – part of a whole-house renovation by architect Melonie Bayl-Smith – took just such a route. 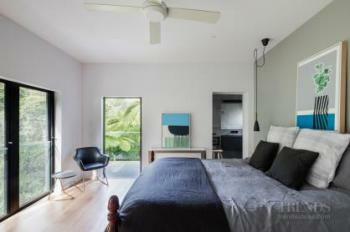 "The reworked master bedroom has stayed loosely in the form it was before. However, we added a wall at one end of the space to create a spacious walk-in wardrobe," says Bayl-Smith. "There had previously been no ensuite and the owners wanted one with a discrete entrance – plus the existing plumbing was restrictive." An old balcony on this corner of the home had been non compliant so the architect elected to replace this with a pop-out comprising the new ensuite and a small balcony. A new pool had also been introduced below – adding to the ambience for the small private balcony. 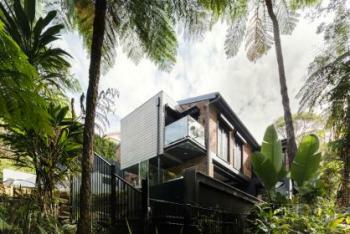 "The addition is clad in Terracade, a fire-resistant, easy-maintenance surface in earthy tones. Low upkeep was a must as the exterior of the extension is hard to reach." Being up high meant privacy wasn't an issue, so the ensuite has glass at both ends. And by locating it at the outer end of the bedroom, the discrete link required between the master bathroom and master bedroom was assured. 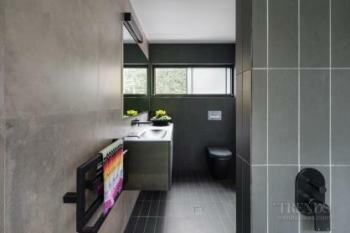 "The owners wanted the ensuite to recede rather than draw the eye, so we went for subdued tones, right down to the choice of black accessories and even a black toilet. 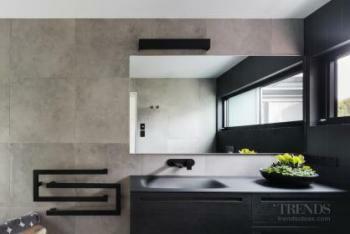 And of course the black glass Falper vanity is the centrepiece." Moody charcoal floor tiles and grey wall tiles were chosen for the main space, while the shower stall comprises a play between the two tiles, adding to the sense of space.